I went to Goodwill the other day. And it was one of those wonderful days when the store is chock full of good stuff. I've discovered that Monday and Tuesday are usually the best days for shopping the thrift stores around here. I think it's because everyone comes out to buy everything over the weekend and then, on Monday, they replenish all the shelves. Whatever the reason, it was a smorgasbord of amazingness. I had a few moments where I almost couldn't contain myself. Like, "I'm about to break into song and dance right here in the book corner" excited. I need to make a habit of this early week shopping thing. Care to see some of the loot I brought home? When I shared my fall mantel a couple weeks back, I mentioned my awkwardly long and narrow mantel and my burning desire to have a neat mirror that worked over it. 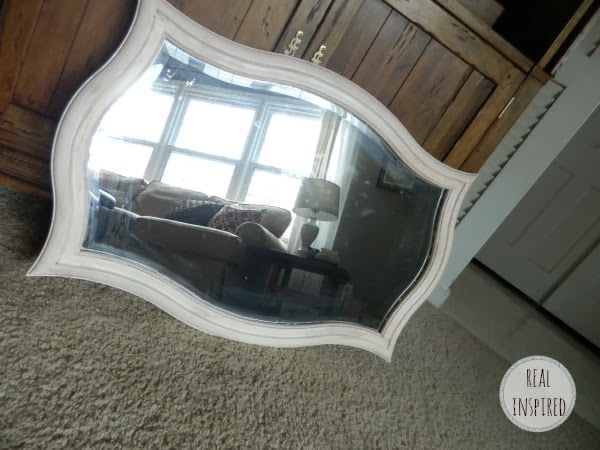 I knew this mirror was the one as soon as I laid eyes on it. It isn't super huge, but it's a decent size. And I love the shape! 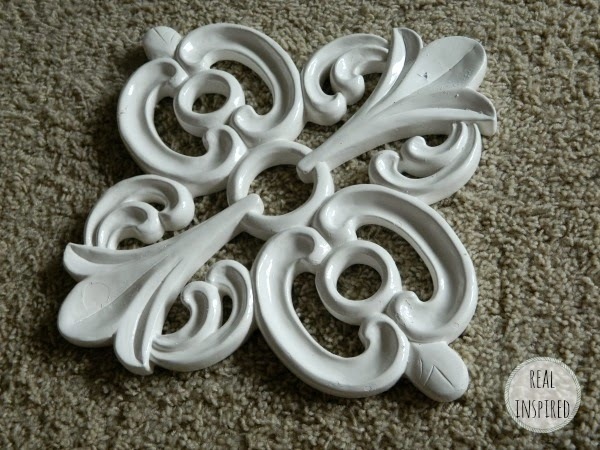 All it needs is a good cleaning and a coat of clean white paint. Also, it was only $5. Total score! 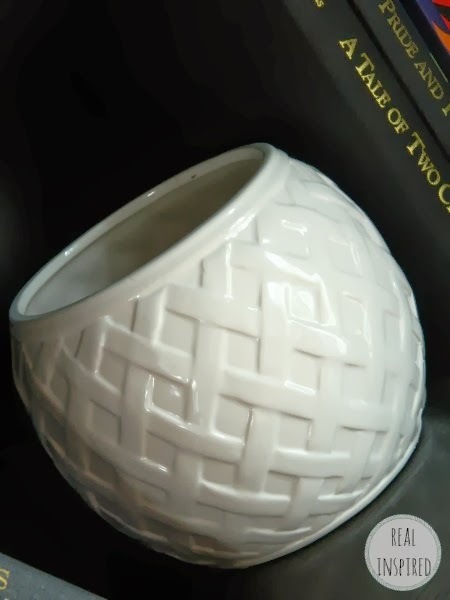 Second score: this vase/thing. Again, another love at first sight moment. I'm not sure I'll be putting water straight into it, but a small cup would fit perfectly inside to do that job. And I think it looks pretty durn cute just sitting empty on a shelf being its bad self. 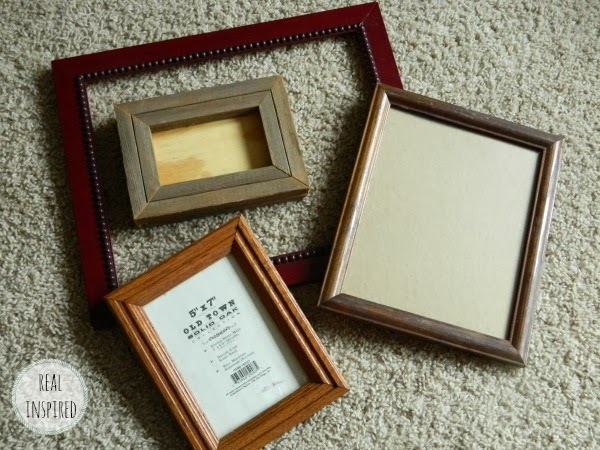 All these assorted little frames for various things. And then this cool wall decor! It's good sized and heavy. It needs some work because the paint is chipping. We'll see if I can make it look better. Want to hear about the one that got away? This coffee table. I've been wanting a round coffee table for months, but I just wasn't sure about splurging on it. It definitely needed some work because it was a bit wobbly, but it was the price tag of $55 that made me walk away. I plan on checking back soon to see if it's still there. 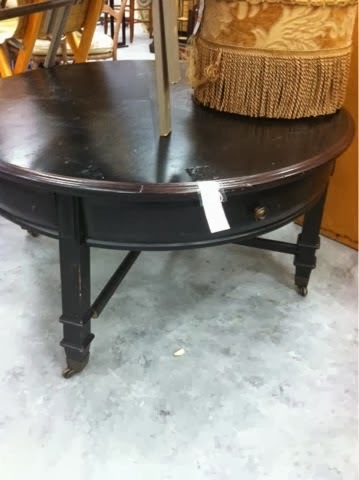 Do you think that price was a little high for a wobbly coffee table at Goodwill? I am so proud of my little haul! There were many other things that I would have loved to bring home, but I had to pass them up. I stuck with things that made me giddy when I saw them or that I had a definite plan in mind for. I'm slowly learning that, when you have a small budget, the giddiness factor is important when thrift store shopping. Otherwise, you will buy EVERYTHING! Have any of your own giddiness-inducing thrift store finds? Share them with me in the comments, on the Facebook page, Instagram, or Twitter. I'd love to see them! Yay, great finds! I love the coffee table, but totally agree the price is too high. My local goodwill prices things like they are made of SOLID GOLD. I don't know what is UP with that! Yes! Thrift stores are getting so pricey. I think they're on to us home bloggers and our makeover ways...it sure stinks!